I was intrigued by Sarah Pikarski’s article in the winter issue of The Gallipolian as my uncle, Lieutenant Francis Hanna, RN (always known as Frank), was Number One of M30, a small monitor of the M29 class armed with 2 6” guns, part of the 3rd.Squadron tasked to cover the Suvla Bay landings. 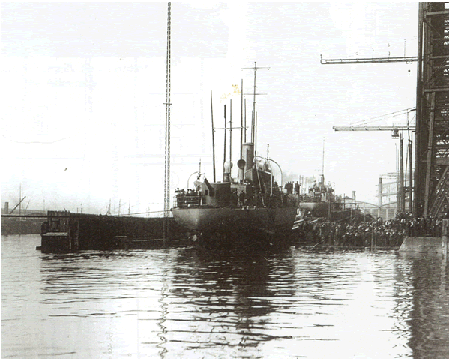 Frank joined M30 in Harland and Wollf’s shipyard in Belfast on the day she was commissioned, 30 June, 1915, and the ship set out for the Mediterranean only 8 days later after completing the most perfunctory Steam and Gun Trials lasting, altogether, 24 hours. The oil bunkers of the M29 class monitors could only sustain the engines for 3 days continuous steaming so, after a short stay in Pembroke Dock, M30 was taken in tow by a merchant ship, SS Glenmore, and so began a slow, tedious passage to Gallipoli, enlivened only by two and three day stops in Gibraltar and Malta. M30 finally cast off the tow rope off the island of Lemnos, anchoring for a time in Mudros harbour before completing her journey with an overnight passage to Imbros arriving in Port Kephalo at 6.35 a.m. on 6 August. The Suvla Bay landings were to take place that night. Commodore Keyes and the naval planners worked under the same conditions of excessive secrecy as their army counterparts and were under orders “not to mention dates, times and places of landings even at staff conferences“(1) so it is quite certain that the officers and men of M30 knew nothing of the offensive and their ships projected part in it until only a few hours before it was due to begin. As the sun set on 6 August the ships carrying the men of the 11th(Northern) Division left Kephalo and at 11 p.m. they were followed by M 30 and the sloop Jonquil which was carrying General Stopford and Admiral Christian, the military and naval commanders of the Suvla operation. After the troops had been landed the ships of the 3rd.Squadron were to give fire support from within the Bay itself, or south of Nubrunesi Point, except for M30 and the destroyer Foxhound which would cruise in the Gulf of Saros assisting the soldiers who were fighting their way along the Kiretch Tepe range stretching 6 miles to the north east from Suvla Point at the northern end of the Bay. M30’s 2 6” guns had each fired 3 “proof shells”, to test the strength of breech and barrel, during the hour long Gun Trials in Belfast Lough, but were not fired again until 7.2. a.m. on the 7 August, 1915, when M30 went into action for the first time standing out to sea to get the necessary elevation (parts of the Kiretch Tepe are over 600’ high) and firing at undisclosed targets at a usual range of 12,000 yards (6 sea miles). On this first day of engagement M30’s 2 6” guns fired 108 shells (53 of them filled with the new Lyddite explosive) but it is unlikely that the fire was very effective. As many historians have pointed out the Navy’s guns were designed to be used in battles at sea between fast moving ships and, therefore, had a high muzzle velocity and a low trajectory whereas the guns best suited for shore bombardment required exactly the opposite qualities. M30’s Mark X11 6” guns, which came from the Navy’s reserve stock, were first used in battle against targets high above them moving in the “broken ground” of the spiky Kiretch Tepe, circumstances which did not favour them at all - the situation cried out for the plunging fire of the howitzer. Also, “spotting” - the observation of the fall of shot so that corrections can be made to range and deflection - was not an easy matter in the conditions in which the ship found herself for, without cooperation from the air or from shore parties, this had to be conducted from a position on the bridge which was only 20 feet above the guns. Out in the Gulf M30 rolled and yawed and, as her commanding officer complained, drifted down to leeward of the firing position in the lightest of breezes (2), rarely providing the stable platform which allowed the gun crews to keep their sights firmly fixed on the point of aim. Later, with experience and the adoption of various ploys, M30’s gunnery was to reach a high standard but it is hard to believe that she, and other craft (sister ship M31 was one), were sent into action as soon as they arrived in the theatre, their guns untried, their crews unpractised in the art of ship-to-shore gunnery and after what must have been a perfunctory briefing if, indeed, there was any briefing at all. The official history “Naval Operations” states that with Foxhound and “another monitor searching the ground ahead ---- General Mahon was able to push along the ridge until the beach was practically safe” (3) but this statement conceals the fact that the original plan for Suvla envisaged that by the end of the day not only would the beachheads be secure but that the whole of the Kiretch Tepe ridge, would be in allied hands. The morning of 8 August found M30, in company with the balloon ship Manica, “Cruising slowly in Ejelmer Bay” which lies at the junction of the Kiretch Tepe and Anafarta ridges. M30’s 6” guns fired 41 shells in 2 spells between 10.27 a.m. until 11.0 a.m. and then from 5.15 p.m. until 6.35 p.m. at a range of 12,000 yards (6 sea miles) the target being the village of Turshun Keui some 4 miles inland down a river valley. On this occasion M30’s gunners had the advantage of experienced spotters (Manica had been engaged in the Gallipoli campaign from the outset) perched high above them in the balloon’s basket passing telephone messages correcting the fall of shot down to the parent ship from whence they were passed to the monitor by flag or light - a process slow but sure in good weather. “Naval Operations” does not explain why the 2 ships were sent to Ejelmer Bay nor does it mention the monitor’s bombardment of a village seemingly unconnected with the battle that was raging elsewhere. However, evidence from other sources suggests that Manica and M30 could, if provided with adequate maps and intelligence (4), have played an important part in the race for Tekke Tepe, the high point on the Anafarta ridge which dominated the Suvla Plain. General Liman von Sanders, the German Commander of the Turkish Vth.Army knew that a fresh Allied offensive was to be made in August, 1915, but kept his reserves back until his enemy’s intentions were clearly known. 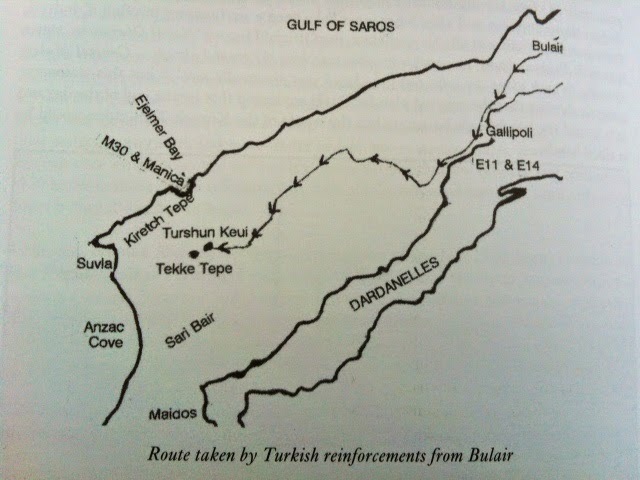 On learning of the landings in Suvla Bay von Sanders sent reinforcements marching hot foot from Bulair, some 35 miles to the north, along a road which crosses the head of the peninsula to reach the Sea of Marmora at the town of Gallipoli from where it follows the shoreline for a short distance before snaking back to Turshun Keui where it ends. Tracks from the village lead up the reverse slopes of the Anafarta ridge to the summit at Tekke Tepe which, unoccupied when the Allied landings were made, should have been a primary objective as General Hamilton observed in his diary. At dawn on the morning of the 8 August, at about the time M30 was opening fire, General Liman von Sanders was in Turshun Keui impatiently waiting for the arrival of the two Divisions from Bulair and was told that they were still strung out along the road, tired and hungry, and could not be formed into a unified striking force until the afternoon. 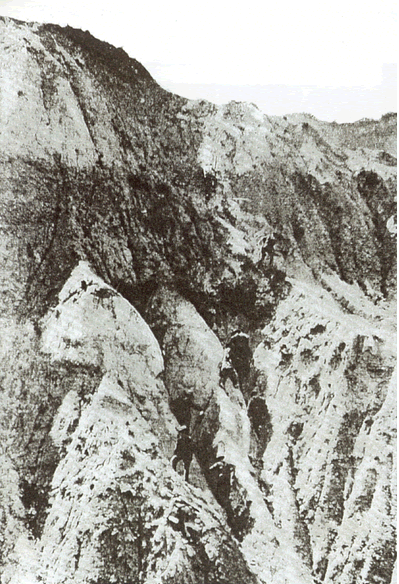 There have been many accounts, sometimes differing in detail, describing subsequent meetings and orders issued but it appears that the bulk of the Turkish force encamped outside Turshun Keui, marched through the village at night and were up on the Anafarta ridge by dawn securing the towering, dominant Tekke Tepe half an hour before men of the British 32nd.Brigade arrived. “---as the men in the leading company went forward the Turks burst over the ridge above them. It was a tumultuous charge and it annihilated the British.” (7) The battle for Suvla was lost. Sarah Pikarski writes of inadequate up to date military intelligence at Suvla and the misuse of what information there was available at HQ. Certainly there must be doubts about how much the officers and men of M30 knew about the overall plan for the Suvla offensive and the part their newly arrived ship was scheduled to play in it. And there are other questions arising from the use of this small monitor to which it would be very interesting to know the answers. If Commodore Keyes knew of the existence of the road Turkish reinforcements would use why was the only planned sea-borne attack on it made by lightly armed, vulnerable submarines off Gallipoli town when it appears that an assault by more powerful surface vessels stationed in Ejelmer Bay would have been be more effective and easier to mount? 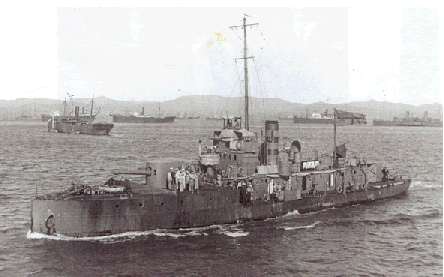 Was the importance of Turshun Keui in the enemy’s headlong rush to secure Tekke Tepe appreciated and, if so, why was the shelling of the village entrusted to just one inexperienced ship when there were 2 other M29 class vessels operating with the 3rd.Squadron in Suvla Bay readily available and even more heavily armed shallow draft monitors present in the theatre? If M30 had been properly briefed and supported could the advance of the Turkish force have been slowed by just that crucial half hour? M30 remained in Ejelmer Bay for the next 2 days before returning to Kephalo early in the morning of 11 August but her 6” guns were only fired for a brief spell of 95 minutes during that time and there is no mention of spotting from the air. Unfortunately Manica’s logs are missing but it is probable that her balloon had to be kept on deck because of repeated visits by a “hostile aeroplane” which was engaged by M30’s 6pdr. HA weapon on each occasion. After two days spent off Helles shelling enemy batteries on Achi Baba M30 had to return to Mudros for her decks to be strengthened and from thence steamed to Mytyleni (now Lesbos) to join the force blockading part of the coast of Asia Minor. In this service she was sunk by enemy gunfire off Long Island (now Chustan) in the Gulf of Smyrna during the night of 13 May, 1916. But that is another story. (1) Robert Rhodes James. “Gallipoli”. (5) The Naval Memoirs of Admiral of the Fleet Sir Roger Keyes, Vol.1. (6) The Keyes Papers. Vol.1.